Are Hawaiians In Danger From Kilauea Lava Lake? Volcanoes are one of those natural disasters that all of us can do without, but they are also among the most fascinating. With how fascinating volcanoes can be its no wonder that the Hawaii Volcanoes National Park receives throngs of visitors each day. As if the lure of volcanoes in general wasn’t enough, now visitors are offered the chance to see a lava lake. But, now the question stands are residents in danger from this amazing find? The Kilauea Volcano was first formed 6 years ago is now home to a lava lake, the Overlook Carter. The Overlook Carter lies inside of the Halema’uma’u Crater, which is usually enough to fully contain the lava lake. The lava lake normally sits about 100 feet beneath the craters rim. Since the craters first appearance in 2008 it has grown drastically in size and now reaches 720 feet in diameter. And now even with its massive size, the lava lake is close to overflowing. On April 22, 2015, it was noted that the lava level inside the crater had begun to rise. While this might be concerning, nobody was too alarmed. However, the lava continued to rise until it touched the rim of the crater on April 28, 2015. Luckily, once the lava reached the top of the crater the levels began to decline until the lava finally came to rest about 12 feet below the inner crater. 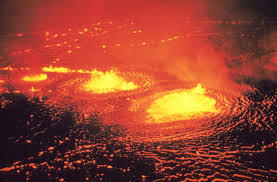 However, the lava rising was cause for much excitement and people from all over Hawaii flocked to the Jaggar Museum Overlook to see the rising lava firsthand. Not only were visitors able to see the lava rising towards the top of the inner crater, but it was the first time they were able to see the lava lake itself. As visitors looked on lava steadily spewed over the top of the crater rim. Deciding that the visitors need more of a show on April 28, the lava lake actually exploded at 10:20 am HST, due to rocks falling onto the surface of the lake. The explosion caused several large deposits of molten lava to be thrown into the air. Several of these deposits made it 280 feet above the lake and landed on the rim of the Halema’uma’u Crater. Measuring 720 feet long and 560 feet wide the Kilauea lava lake is the second largest one in the world, which is another reason it draws so many visitors. Even with the explosion visitors are still being allowed to view the lava lake, but only from a safe distance. In order to view the lake visitors must bring binoculars, as they will find themselves on the opposite side of where the crater is erupting once they pay their admittance fee. Visitors flock there during the day, but after sunset is when visitors are shown a real treat, as the lava creates quite a vivid glow that lights up the plume of smoke and the clouds above. For those of you that can’t make it to the park in person to see the lava lake the Hawaiian Volcano Observatory will be running several live webcams that will display live images in infrared wavelengths, as well as a live feed.